H Mates is one of top online dating sites catering to singles living with STDs. It is a free site with 10,000 and more active users and a total monthly visitor number of 22,502. The site offers a safe and easy means of accessing other members with Herpes / HSV or HPV or any other STD, for friendship, companionship, love or support. It was started in February 2004. You can access online profiles with photographs. It also supports member video, so that you can view other members. The search function is excellent. Users can create their profile with unlimited photographs and even add a recorded video introduction to the profile to help other members get a better idea. Other interesting features include, virtual kisses to show your interest in a member. Free membership allows browsing of profiles, contacting other members, sending and receiving emails, view who’s online, chat rooms, matchmaking features with a compatibility or questionnaire test, last visit date and forums. In addition, you can send winks and create a favorites list, and send flowers or virtual gifts. Privacy concerns are adequately addressed with proper screening and ID confirmation against any criminal records of members. In addition, the internal email system allows a private means of communication and is of very good quality, with anti spam as well as filter options, which is quite rare on online dating sites. You can also have access to features that enable the member to control those who can view their profile. The live chat function operates similar to Google Chat or MSN, allowing members to contact each other. The matchmaking feature allows members to answer a wide range of questions based on relationship and lifestyle. The site also offers a directory where you can find treatment locations for STDs, along with many specialist articles and news on STD, helping them manage their illness better. You can also access links and forums related to STDs to get the best resources for HSV and HPV. By giving a donation to the site, you can access some additional features, such as unlimited number of emails, indicators for message status, so that you can know if your message is read, deleted, etc. The additional amount allows you to highlight your profile. 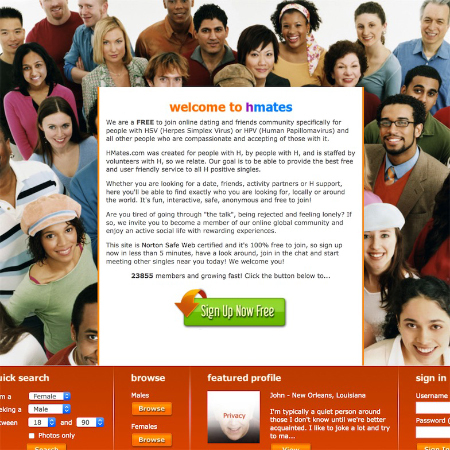 HMates.com offers several good features for people with HSV, HPV or any others, with all this offered for free. The layout and navigation is simple. Though membership is free, they accept donations.